Falkirk’s new centre-back Tom Dallison says he is excited to be joining Falkirk’s new-look squad ahead of the coming Championship season. The 22-year-old moved to the Bairns from Brighton and Hove Albion, where he had played for five years, and is now working hard at the pre-season camp in Wales. 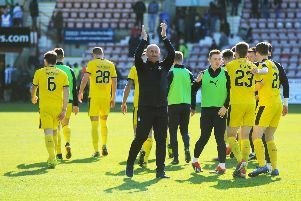 The Englishman spent five years on the south coast, but has been on loan at five different clubs: Dartford, Braintree, Crawley Town, Cambridge United and most recently Accrington Stanley and is now looking for more permanent first team football at The Falkirk Stadium. The defender says Scottish football is a more attractive prospect than ever before for young English players. Dallison was the first of manager Paul Hartley’s ten new signings to arrive after signing a pre-contract with the club last season whilst playing with Brighton’s under 23 side. “Towards the back end of last season I heard of interest,” he said. I came up, watched the St Mirren game, met everyone and got a great feel for the club before going backand playing for Brighton having signed the pre-contract here already. Dallison comes to Falkirk with plenty of high-profile youth experience having played for both Arsenal and West Ham United before joining Brighton but is happy to have signed a two year contract with the Bairns and hopes his stay north of the border can become something more long-term. Manager Paul Hartley was also important as Dallison decided to move to The Falkirk Stadium: “Speaking to the gaffer, the way he wants to go forward and the way he wants to play - it really enticed me. A number of Paul Hartley’s summer recruits have already met each other whilst playing in England. Six of the ten signings have come from down south, with five of them being English. At 22, Dallison is much in line with the average age of the Falkirk squad. The boss is only too aware that the group is young and inexperienced, but believes that will be weighted out by hunger and desire. “We are very young. The players are hungry, especially the guys that have come from Premier League teams with a point to prove,” the manager said. “It’s a great opportunity for them to express themselves and play first team football for the first time. Hartley added experience to his youthful side with his tenth summer signing, Northern Ireland international Paul Paton, announced on Saturday. The midfielder, 31, is now the oldest player in the squad by a few years and adds much needed experience to a squad which has an average age in the low 20s. Paton captained Partick Thistle to the Scottish Championship in 2013, and signs from Plymouth Argyle.